Todays episode is a little bit of rambling on my part about Pawsox stitch and pitch and wecansolveit.org. Tink and Wink sit down to talk about there shop Yarn’s in the Farms. The door at YITF should be open today! It’s gettin’ on towards spring in New England! Ice cream and knittin’! YAY! It was awesome :) I really wish I lived closer to Boston so I could check out some of these awesome shops you go to. Tink and Wink sound like lovely people. I love YintF, it has a wonderful atmosphere, as well as lovely wools. It was fun to hear a little background about Tink and Wink and how their business began. Great shop in Beverly Farms – Tink and Wink are so helpful! There’s home, there’s work, and then there’s YITF! I t is so fun, always something new to see, inspiring me to knit knit and knit some more! It’s all there, everything I need especially the suggestions and genuine support (not to mention wacky wisdom and hilarity) from Wink and Tink. Each season brings new and fun yarns and designs — you know, that feeling when the yarn just calls OUT to you to be held, to be chosen to take home… yes, nothing quite like it, when you swoon over a color blend, a texture, a certain feeling evoked, the creation takes shape… and all the fabulous knitters who cluster there at the shop, showing their pet projects, their creativity rubs off and flows in so many directions. And I can’t miss Wednesday’s Knit Night! Another great episode :-) That is such a cute little shop and those ladies seem soooo sweet! I just started knitting socks and i think i have a VERY easy way for you to prevent the “ladders” that you mentioned before. Every couple of rows change the location of the ‘breaks’ between the DPNs. This will scatter the “ladder” stitches around in such a way that they are never noticed. I didn’t have ladders, per se, but I found that if I knit a whole sock with the break between the DPNs at the same place all the way up the sock it resulted in a loose stitch that looked sort of like a permanent fold. In other words, I had 14 stitches on four DPNs (56 sts total) and every three rows or so I knit about 4 stitches directy from one of the active DPNs onto the next one (as opposed to using the 5th free needle) all the way around. And then changed back to using the 5th needle. This was super easy and IT WORKS! Anyway, I’ve gotten many enjoyable hours of knitting companionship through your podcast and I just wanted to share this tip back with you since you seemed so annoyed with your sock ladders. What a fun episode! It sounds like Tink and Wink are joys to be around, overflowing with energy and enthusiasm. You all sounded like you were having a great time. I doubt I’ll get to visit their shop, as my Florida lifestyle (such as it is) doesn’t include yarn shopping in PA, so thanks for giving me a glimpse into YitF. I don’t know if you look back at these comments, but this was a great show. 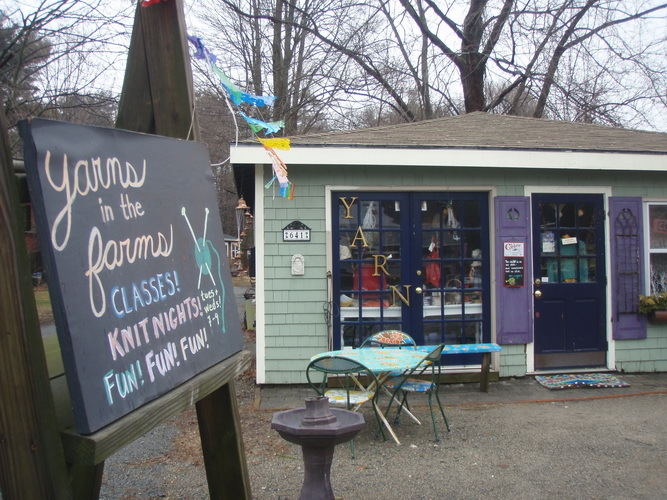 I just looked at the pictures of Yarns in the Farms and I could tell from your interview that their shop would be full of wild and wooly creations. What an inspiration! Thanks for your interesting interviews.